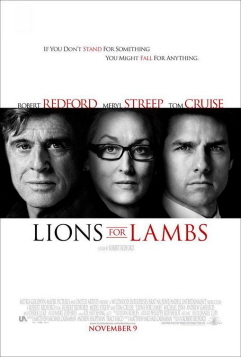 * “Lions for Lambs“: Read my full review here. Pure Robert Redford anti-war agitprop and very boring at that. Getting really tired of the “Traffic” mode of movies, where three separate stories connect. Come up with something new. A smug, caricature right-wing Senator (Tom Cruise) gives a liberal reporter (Meryl Streep) a scoop on a new strategy in Iraq and Afghanistan, “Forward Operating Points.” She doesn’t buy that it’s anything new and has a two hour argument over the War in Iraq with him. Meanwhile, two of the soldiers carrying out the new plan–a Black and a Hispanic–are shot down in the mountains of Afghanistan and surrounded by Taliban Mujahideen. Meanwhile, their former college professor (Robert Redford) is lecturing a failing slacker student about them and about how he’s not doing his part, while minorities are dying in Iraq. The End. Again, Read my complete review. * “Blade Runner: The Final Cut“: This is only in New York and Los Angeles, but in the rest of the country by next Friday. When I recently previewed this movie on this site, readers surmised that it is no different than the “Director’s Cut” of the original “Blade Runner.” And they were basically right. The special effects of the original movie were so ahead of their time that there was little that needed to be done to improve upon the original. A few changes involve using the real (but very aged) Joanna Cassidy to play her own stunt double instead of a man, when she crashes through plate glass. A few minor errors in dialogue are fixed. Some advertisers in product placement on buildings were removed, but not Coca-Cola and the now-defunct Pan-Am. Guess it gets reborn in 2019? And that’s about it for the differences. Still, I loved seeing this movie on a giant screen, where it was meant to be seen. Seeing it on DVD at home simply does not compare. I love this movie so much that even though it is basically an updated version of an old movie, it goes on my TOP TEN MOVIES OF THE YEAR list, with an asterisk for obvious reasons. Well worth the ten bucks to see it again in the theater, even if you remember it well. Mostly playing at arthouse movie theaters, including the Landmark chain owned by Mark Cuban. So, is Harrison Ford’s Rick Deckard a replicant? It seems like it, now more than ever. What do you think? * “Fred Claus“: Did you know Santa has a loser older brother with a great sense of humor? He does, and he’s Vince Vaugh a/k/a Fred (Santa is a fat-suit-wardrobed Paul Giamatti). Like most dysfunctional families, they have their differences, and this year, Santa can’t put up with them, since he has an efficiency consultant breathing down his neck and trying to put the North Pole out of biz. I liked this movie a lot because of Vince Vaughn. He’s his usual hilarious self here. Consider it a cleaner version of the guy he played in “The Wedding Crashers,” but suitable for children’s viewing. 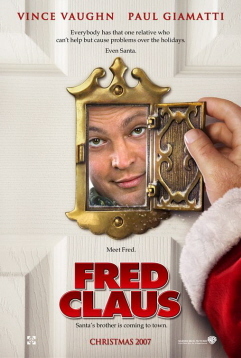 When we meet Fred Claus, he’s a ne’er-do-well trying to get $50,000 to open a betting parlor in Chicago. His meter-maid girlfriend is about to dump him over neglect, and he’s on he’s on his way to the North Pole to earn his 50 Gs from bro Santa. The ending (er, five endings) was a little too neat and cheesy, but still, the movie presents a great message of family and reconciliation between estranged siblings. Great for your kids and enjoyable for you. The one prob I had with this movie was that it was waaaaaaaay too long. It was two hours and could have been a half-hour shorter. It ended like five times–five false alarms before it finally ended. That was unnecessary, as was the non-speaking father of Santa. Boy was he whipped by Santa’s mom (Kathy Bates). Still Vince Vaughn’s humor makes up for it. * “P2“: The best horror movies and thrillers involve psychological scare tactics, not blood and gore. This one started out with the former, but, sadly, degraded with a very gruesome, violent, bloody torture-murder scene it could have done without. Other than that, I liked it. But that scene makes the movie unwatchable and insufferable. It simply wasn’t necessary. A young woman is the last to leave her New York City office building on Christmas Eve. When she gets to the second parking level–P2–where her car is parked, it won’t start. At first, she seeks the night-time parking attendant’s help. But soon she learns he is the reason she’s stuck there and he terrorizes her as she tries to survive him and his violent dog. There are no big names or even semi-names in this, which adds to the movie, because you focus on the story, not the actors. The biggest actor, really, is the parking garage, where the movie mostly takes place. Also, very well shot and full of suspense. Definitely not for kids. At all. * “Sleuth“: This is a remake of the early 1972 film which starred Michael Caine as a young man who’s stolen away the wife of a rich man. The man lures him to his house. 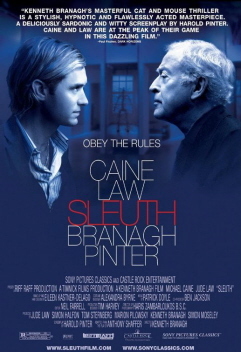 This version stars Caine as the rich man and Jude Law as the young man. But where the first version was a classic, this one is too emotional and overwrought. Plus, we can smell the plot twist a mile away. What was novel in 1972, is tired, haggard, and obvious in 2007. In this one, too, it tries to compensate for that with a sleek, uber-contemporary house that comprises the set. But the house becomes too much the star of the movie. This one is entertaining enough. But the original is not matched with the newer, more tweaked and gay-ized story. This is mildly entertaining, but the 35-year-old version is more worthy. Rent it instead. Debbie: Haven’t seen the new version, of course, but the “Sleuth” of 1972 contains one of Sir Lawrence Olivier’s greatest performances, and I seriously doubt that even Michael Caine could duplicate that; he was quite excellent as the younger man in the ’72 original, and I generally like him in any role, but he just ain’t Olivier (then again, who is?). Strangely, perhaps, I’d rank Olivier’s performance in “Marathon Man” as nearly as good as that in “Sleuth” (“Is it safe?”) — he sold the character Zell as absolute EVIL on the screen in that one. 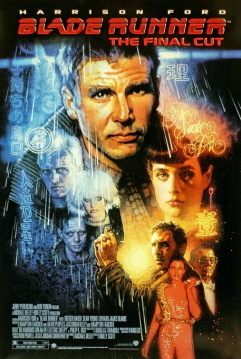 Per your recommendation, I look forward to the “Final Cut” of “Blade Runner” (far, far ahead of it’s time, indeed) on the big screen, upon its wider release. Love your reviews! Keep up the good work. anyone else notice that Redford looks more and more feminine as he ages?